Ulthuan • View topic - RE.Lee's "Record of Lost Colonies"
RE.Lee's "Record of Lost Colonies"
Post subject: Re: RE.Lee's "Record of Lost Colonies"
RE’s opponent does not corner! I know. And I approve. But there is some middle ground between cornering and rushing out into the jaws of death. I think taking a slightly more cautious approach and keeping a more coherent battleline would have helped. Though with the skaven managing to remove a canon T1 already and threatening more of the shooting, keeping ranged superiority was not a given. Generally Dwarfs outshoot the opposition and they’re slow, so pushing is a bad option. Attacking, even in a favourable situation is fraught with difficulty because they don’t have the speed to adjust if things go wrong. That said, it can work and I agree this was badly executed. Allowing a triple charge on your main block is optimistic in the extreme. Attacking, even in a favourable situation is fraught with difficulty because they don’t have the speed to adjust if things go wrong. I think this is a big issue indeed. If you're running M9 cavalry then being out of position often only means the delay of a turn. If you're M3 infantry then being out of position means you just don't contribute anything to the battle anymore. I think this is one of the reasons Lord Anathir claimed dwarves were one of the hardest armies to play. And even when castling and playing a gunline, any mistake in positioning would be hard to correct and could be ruthlessly exploited by your opponent. Still not sure what the dwarf player could have done differently though. The large skaven blocks were difficult to deal with and could always either occupy a unit for a turn until backup arrived or just grind it down with numbers. The skaven could just suffer losses a lot better then the dwarves. Yup, it was a hard matchup, but the charge was a bit too reckless, anyway. All three Dwarf units could have handled the Abomination and then perhaps grind down the Stormvermin. As Rod said, keeping them in order would have at least given them a chance. My opponent was tricked into chasing the Gutter Runners when they had already done their job. Also - our Dwarfs march at 3xM, so that's partly why they tend to be more aggressive than most. 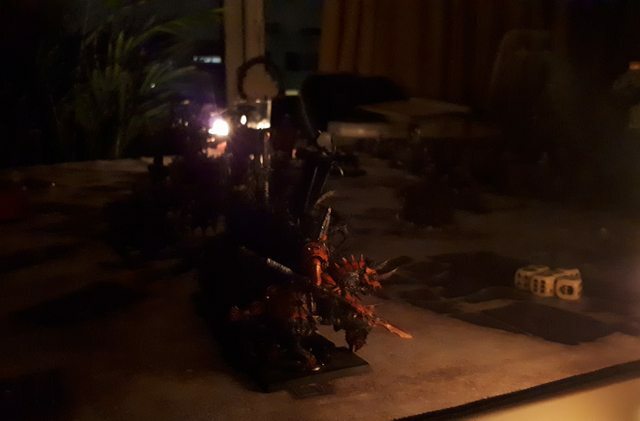 I'm playing the final battle of Chaos vs VC tomorrow, wish me luck! I like the 3xM march. It matches the dwarf hardy nature. And it opens a bunch of different playstyles for them that probably make them more interesting to play. There was a blackout during the game.